BLOG - BETWEEN A ROCK & A HARD PLACE: Nell Bryden goes BACKSTAGE. NELL BRYDEN sings from the heart and shoots from the hip. The blonde bombshell from Brooklyn has the urban lifestyle in her blood, the country/folk spirit of Americana in her soul, and the great American songbook in her head. Love and loss are the fuel that lights her songwriting fire. Rhythm and melody come as naturally to her as a morning latte in a Greenwich Village café. And a well-travelled journey through life provides a rich seam of experience to mine. She’s a native New Yorker with a fondness for old-time music and vintage clothes, who’s seen the world and absorbed its musical influences: country and jazz, blues and soul, and more besides. You can hear as much of it – or as little – as you care to find in her music. Because, for all its familiar scents and flavours, her songs are distinctly her own. 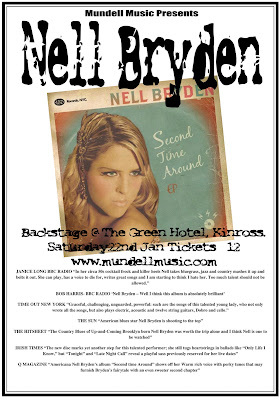 Nell plays 'LIVE' at Backstage at the Green Hotel, Kinross, Scotland on Sat 22nd Jan 2011.